Most states have "Scenic Byways," highway routes that might take a bit longer, but go through nice scenery and natural areas. 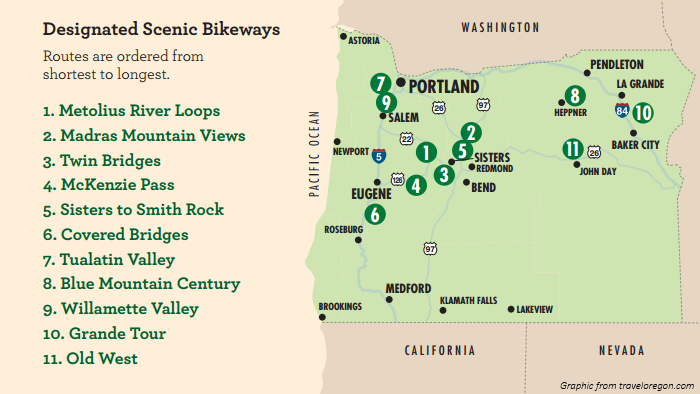 Oregon has something a step better: Scenic Bikeways! 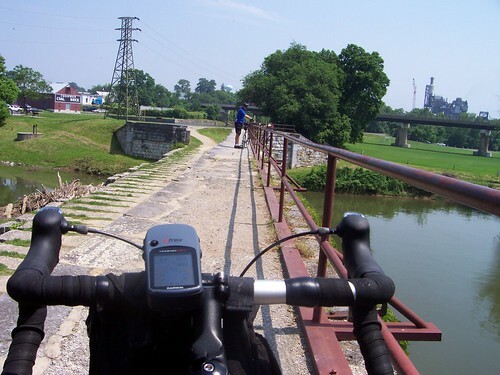 There are 12 Scenic Bikeways across the state, ranging from 24 to 180 miles. 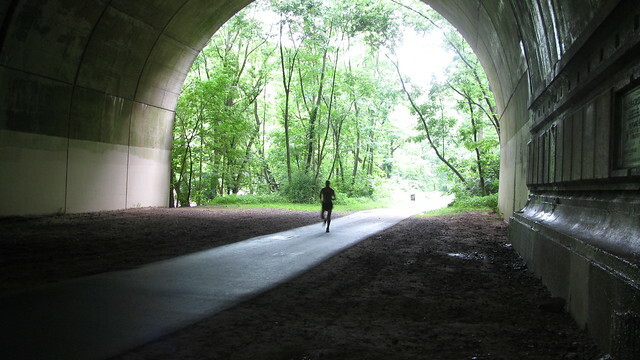 I recently spent a few weeks commuting in our nation's capital, and my best route was through Rock Creek Park. I wish I had a permanent commute along a route like this! Folks playing in the park. 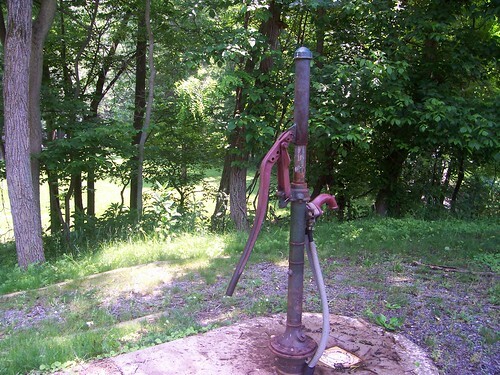 The pictures in this post are from previous trips; I didn't have a camera this time. We only went for a short ride, but it was nice to see the city at night and enjoy some time on our bikes with friends. Apparently there is a long tradition with a certain group that on the shortest day of the year (or nearest convenient day), there's a bicycle ride down the American River Bike Trail. This year I was invited along by the executive director of my local bike advocacy group (which I'm on the board of). The trail is historical and beautiful. 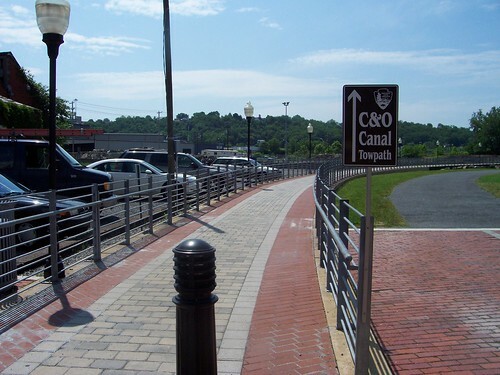 It was one of the first trails specifically made for bicycles in the US, and one of the longest purpose-built paved bike paths in the US. 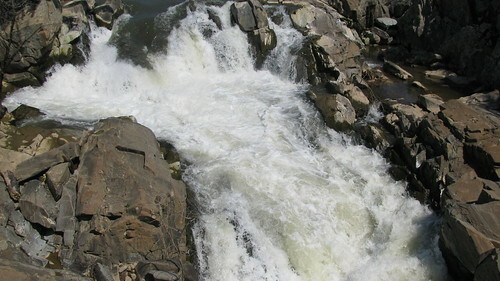 It's about 30 miles long and follows the American River from Folsom to Sacramento. It's essentially 30 miles of park with a nicely paved trail running the length of it, bridges where needed, etc. Lots of parks of various sizes along the way, from tiny little "one picnic table with a view" parks to big sprawling parks. Some of the parks have big parking lots, so if you don't want to ride the whole distance you can start there. We used light rail to get from Sacramento to Folsom and then rode the downhill/downstream direction of the trail. The day started at 5:45am, when my bike and I were picked up for a drive down to San Rafael. We met up with somebody, rode about a mile and met up with the truck that drove us to Richmond while we nervously watched the bikes jiggling around on the overloaded rack. In Richmond, we got on Amtrak to Sacramento, then on a light rail to Folsom. Had a bit of breakfast on the Amtrak ride consisting of food people brought along, such as some homemade gingerbread and banana bread. The usual tradition in this ride is that there's a rainstorm and epic suffering, but the weather was fantastic this year, so I put away both upper layers that I'd brought along and went until evening in shorts and a t-shirt. After the light rail, there was a very short ride up a hill to our second breakfast, for kicking off the ride. 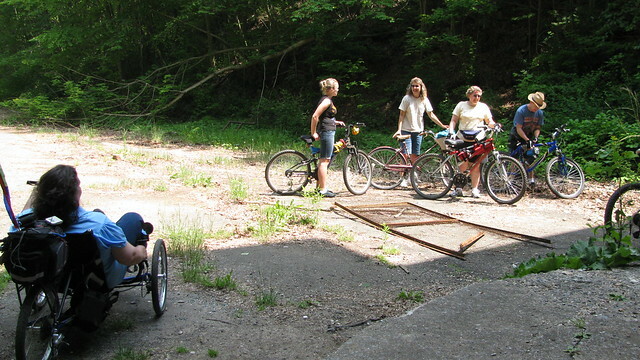 Then after that, a ride over to the trail, and off we rode. Most of the trail is lightly shaded with trees and really quite pleasant. Our ride ended in Old Town Sacramento, a historic tourist-attracting neighborhood that happens to be right next to the Amtrak station to get us back to Richmond. We got some dinner, a few of us got lost finding the train, got some cocktails at a bar on a boat, and caught the next train. 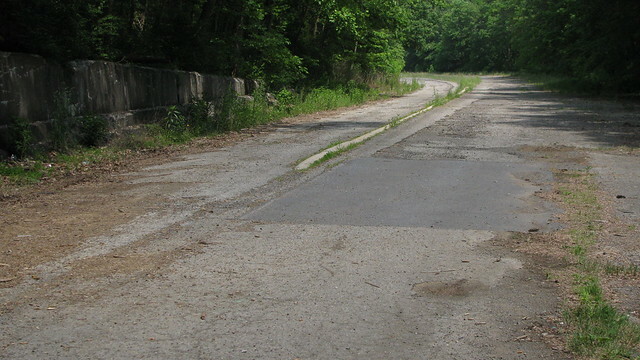 This 8-mile section of the old PA Turnpike was abandoned in the late 1960's. The pavement is now cracked, overgrown, and it feels lonely and dead. But it's actually fun to ride on! We met a group of folks from Bikeforums.net at the access point. There's a sign before you enter that, in effect, lets you know you're riding at your own risk. 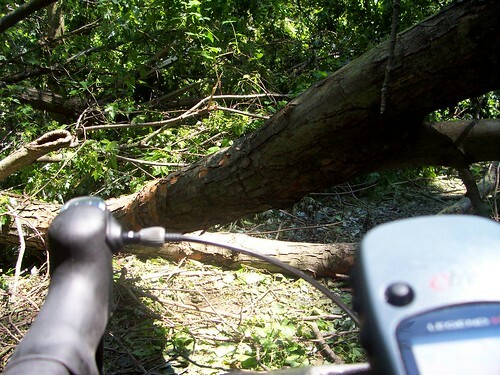 In fact, I wasn't entirely clear on whether riding here is legal or not. 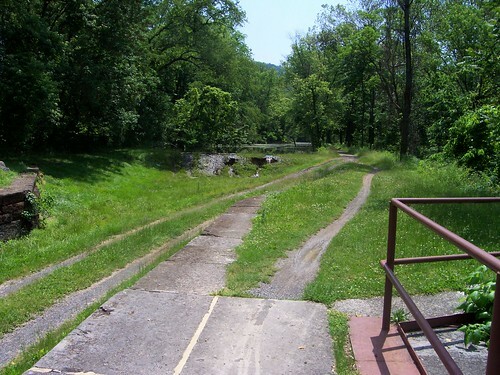 This is more of a stroll than a ride; you really can't go that fast, or that far--but riding on what used to be the Pennsylvania Turnpike is a strange experience, and one I found well worth the drive from New Jersey. 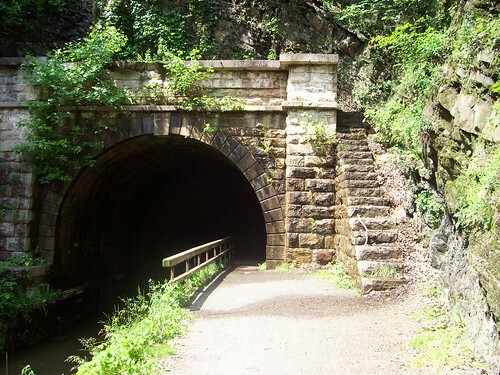 PA Turnpike Bike Trail - includes a map. I found I had an unexpectedly free weekend, so decided on a short weekend tour. Why not, yes? I had the time and the bike and the desire for it. 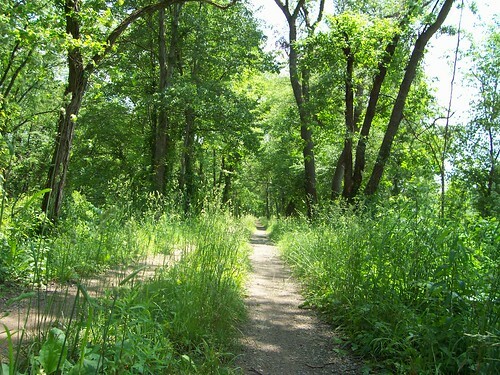 My route would take me through Pennypack Park on the way out of Philadelphia. The Pennypack Park path is paved, and is quite twisty and hilly. Since the first day of the tour was characterized by rain, I had to take it easy when rounding corners. 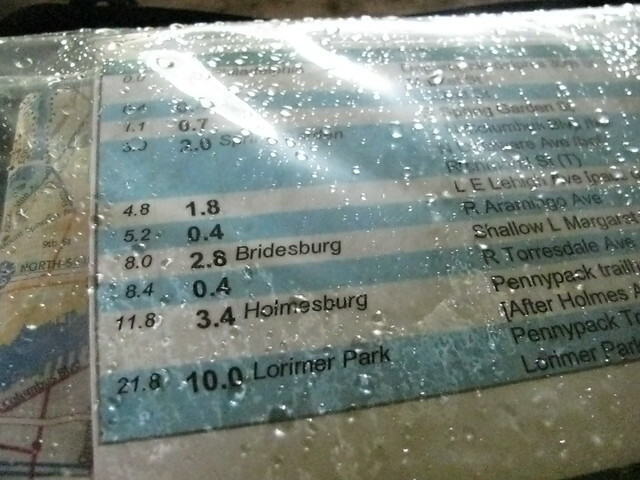 The rain became more than an annoyance perhaps a mile after entering the park, so I took shelter under the Bensalem Avenue Bridge. While waiting, I reviewed my directions yet to come. 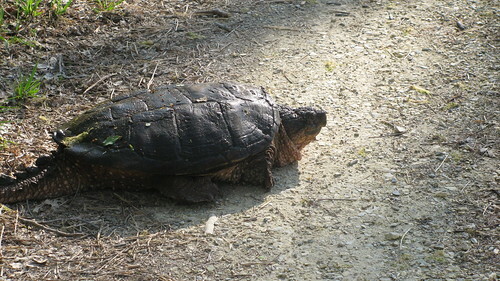 I didn't have long until I got to Tyler State Park and the hostel there. I had no idea at the time that the rain later that day would be so poundingly, painfully thick that I'd accept the offer of a ride for the last few miles. The park is quite beautiful. I would probably be using the modifier breathtakingly if I had seen it in the rain. 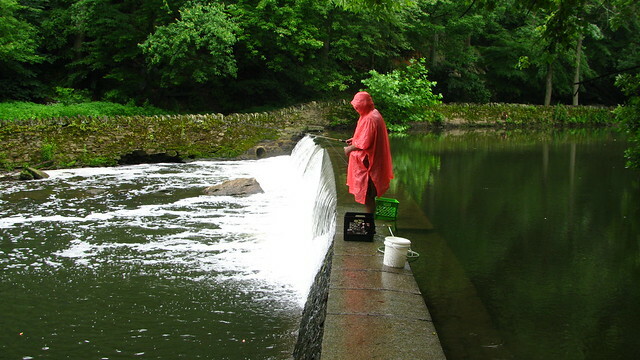 Pennypack Park is only a few miles in length, but it's well worth the trip. This guy rode his bike to the park with his fishing pole. He clearly wanted to be left alone, so I did. The park has nearly ten miles of path, but I left the trail at Lorimer Park, a mile or so before the end. This is a good place to park if you're going to drive here. 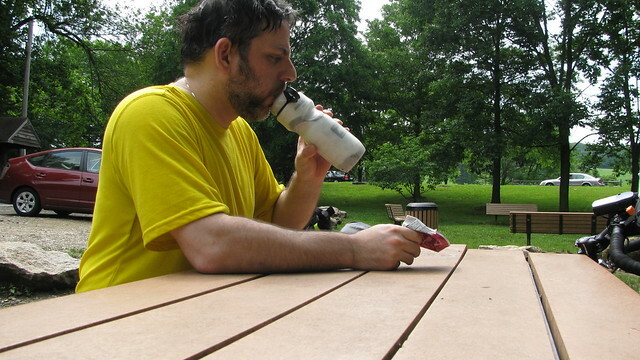 Pennypack Park is a great place for a day's ride. You'll use your hill-climbing gears here, but the hills are all short sprints. 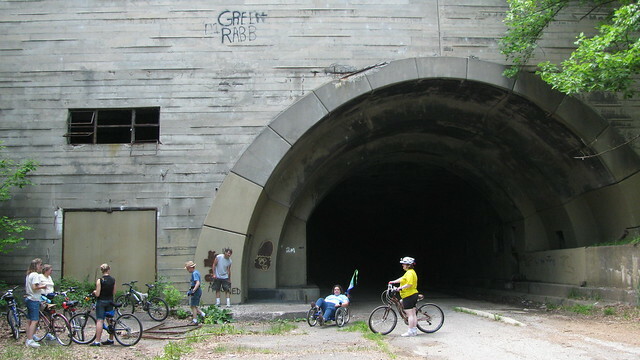 This'd be a challenge for kids or new bikers, or a fun diversion for seasoned cyclists.